If you are an educator and looking to re-fresh your music education-related technology “chops” (or simply to develop them! ), look no further than the TI:ME courses being offered across the country this summer. I can’t encourage membership and participation in the TI:ME organization enough. It offers incredible services to the music education community. TI:ME (Technology Institute for Music Educators) was established to assist music educators in applying technology to improve teaching and learning in music. You can find detailed information at the TI:ME site, courses, and certification here: http://ti-me.org . If you are looking to study with me, in particular, I will be teaching a TI:ME level II course in July, completely online, through Valley Forge Christian College this summer. More details about my course can be found here. 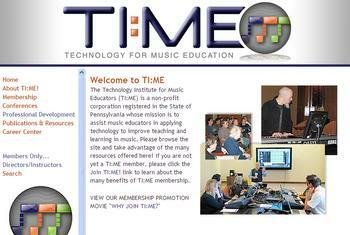 The TI:ME certified instructors are literally a list of “Who’s Who” among Music Education Teachers. Below is a list of states that are offering certification this summer and a list to their individual times and details. Please feel free to visit these sites and the TI:ME site for more information. As always, you may ask me questions below in the comment section and via twitter: http://twitter.com/pisanojm – @pisanojm I look forward to many of you taking advantage of the TI:ME opportunities this summer!